LAS VEGAS — The JACL National Council on July 13 unanimously passed an emergency resolution supporting the establishment of the Tule Lake National Historic Site and the protection and preservation of that site. 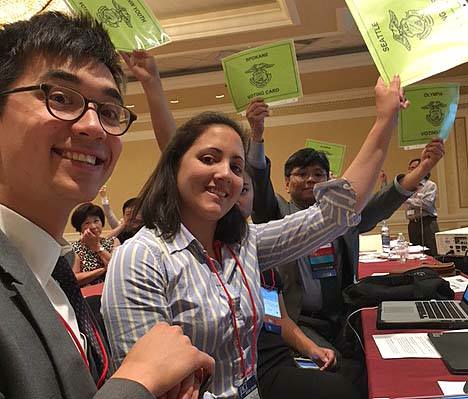 The resolution was introduced by the Seattle Chapter during the 47th JACL National Convention, held at the Monte Carlo Resort and Casino in Las Vegas. The chapter said that the proposal could not have been submitted late because two bills relating to the status of the Tule Lake concentration camp site proceeded to committee hearings — June 15 in the Senate, June 23 in the House — after the deadline for filing resolutions. The bills were passed out of committee and will go to conference committee for reconciliation. The resolution was spearheaded by Stan Shikuma of the Tule Lake Committee and Seattle JACL President Sarah Baker (Pacific Northwest District) and co-signed by Andy Noguchi from Florin Chapter (Northern California-Western Nevada-Pacific District), Phil Shigekuni from San Fernando Valley Chapter (Pacific Southwest District), Sandra Grant from Wasatch Front North Chapter (Intermountain District) and Toshi Abe of Philadelphia Chapter (Eastern District). The Tule Lake Committee, which has established a Change.org petition to oppose the fence, said in a statement on the “Stop the Fence at Tule Lake” Facebook page, “Surrounding the Tulelake Municipal Airport with a three-mile-long fence would destroy the physical and historical integrity of the site where 18,000 people were imprisoned during World War II. “Site tours would no longer be possible, and visitors could no longer experience the dimension and magnitude of the concentration camp where people walked long distances to eat meals, attend school, do laundry and use the latrines. The site, a portion of which received designation as a National Monument in 2008, housed the largest number of prisoners, stayed opened the longest and was the place where ‘troublemakers’ from other camps were sent.